The horrible bulging arête left of Prophet of Doom. Grovel fearfully up on suspect rock. At least one early attempt resulted in the removal of a considerable amount of WHIT'S shin when a foothold broke off. Spaced pro, and a lot of it's not very good. Only really 17 but gets one grade for grovellyness and two for suspect rock. 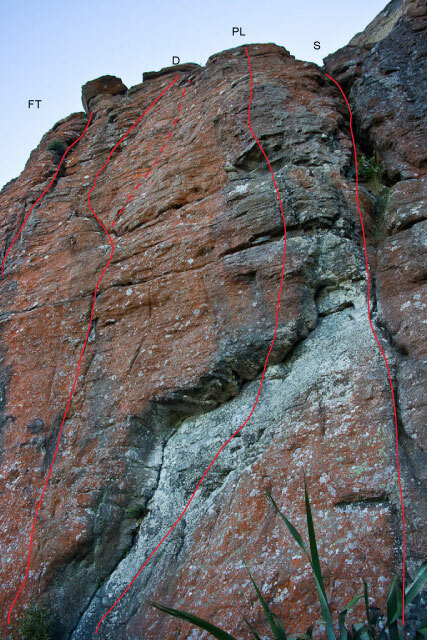 Climb directly up a small prow 1.5m left of the start of Feeding Time past a bolt then directly up the wall past 4 more bolts (crux at the horizontal break) to a double bolt belay. Strenuous and fingery at and above the break, slightly easier towards the top. The faint line through the overhang on the left of the wall. Follow up the crack line on good holds, a good runner (5 hex is perfect !!) just on overlap protects hard moves to gain a horizontal break (crux). Clip the bolt above the break and proceed with gradually pumping arms up steep wall/groove above (natural pro: small-to-medium wires). Anchor chains just below the top. Climb the wall right of FTATZ into the shallow scoop, clip the bolt and execute devious moves to gain the finger slot. Crank up to the somewhat disappointing ledge, then grovel up 'til you're standing on it. Place smallish cams in the horizontal break or the diagonal crack just left. 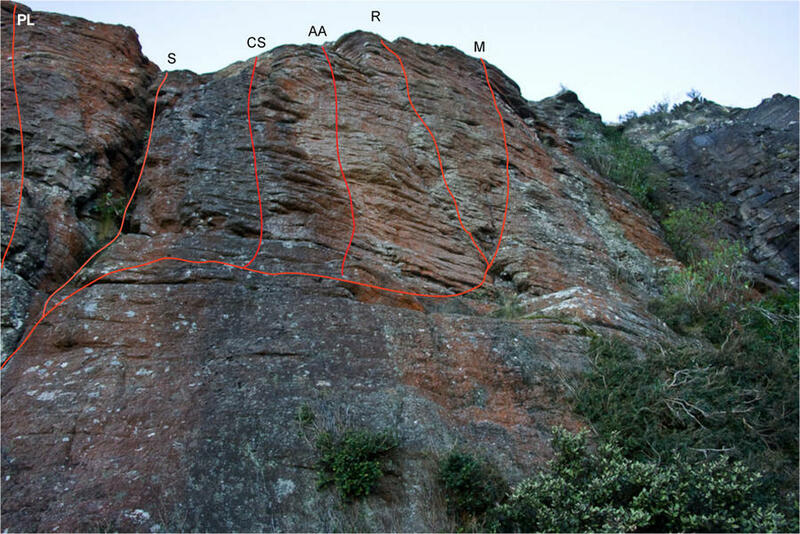 The original finish (recommended; sustained and technically interesting) goes straight up and now has a bolt - hardish moves to get established in the 'dimple', then easier climbing to the top. There's also an optional nut placement high on Promised Land. 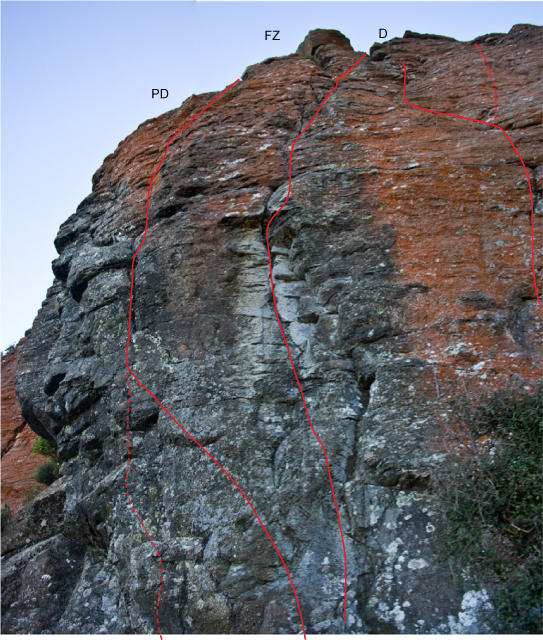 The alternate finish is to climb the shallow groove on the left to an RP placement, then move back right to the belay. Shares double bolt belay with Promised Land. The wall and crack right of P.L. Climb Steppenwolf to the ledge then follow a faint weakness between Steppenwolf and Restless. The tussocky crack right of the Restless wall. Use the bottom bolt on Restless to protect the traverse. Nice moves on good holds although the pro thins out a little towards the top and the belay can be awkward. CDs are useful.